Hit Ctrl+f to open the Find Window, or click the Find button (the !) on the Extended Playlist. 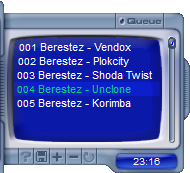 Here you can find tracks in the playlist or in the library. On top is the Find box, where you can type your search terms. Results will appear after a small delay. When you hit enter or click Apply, the search filter will be applied and matching tracks will be highlighted in the playlist. With the dropdown box on the top right of the Find Window, you can choose where XMPlay should search for these terms: in titles and tags, in filenames, or in titles, tags and filenames. If you tick Single phrase, XMPlay will look for the exact phrase you put in the Find field. If it's unticked, XMPlay will look for tracks which contain all (space separated) Find terms. You can exclude certain terms by prefixing them with -, or look for either of terms using /. For example, a -b c/d would look for tracks containing a, but not b, and at least one of c and d. Ticking Case-sensitive will look for the exact (upper or lower) case you type it in. Invert turns the results around, so the result field will contain all tracks not matching your criteria. By default, all results will be selected, so you can perfom the same operation on all of them (like adding them to the playlist). On the bottom you can also choose to Include the library in the search, rather than only the files in the playlist. If you tick Skip non-matching tracks, XMPlay will set all other tracks to Skip and play only tracks matching your search criteria. Note that there is also a Find quick (a.k.a. Find as you type) shortcut (Alt+F by default), which uses all the settings from this Find dialog (except Invert), but allows you to search for tracks without opening the Find window.